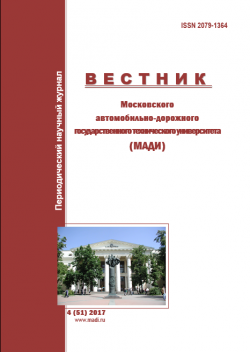 The journal «Vestnik Moskovskogo avtomobil'no-dorozhnogo instituta (gosudarstvennogo tehnicheskogo universiteta)» was established by the State Technical University-MADI in 2003. The journal was renamed in 2010 and from issue №2 ( 21 ) is issued with a new name "Vestnik Moskovskogo avtomobil'no-dorozhnogo gosudarstvennogo tehnicheskogo universiteta (MADI) ( abbreviation "Vestnik MADI"). 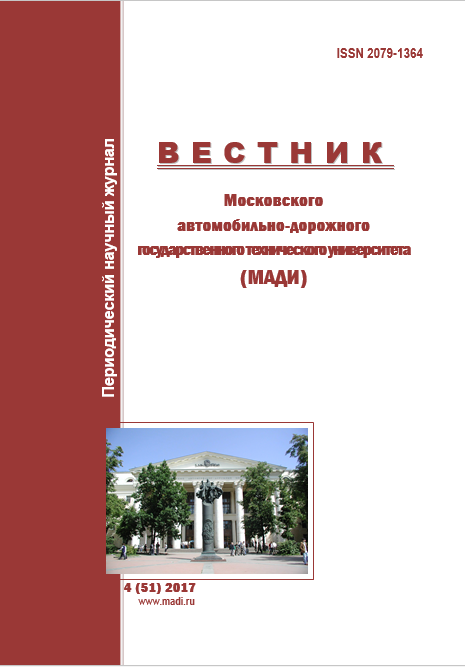 The necessity for such journal appeared due to demand to introduce new experience and results of scientific research on motor transport, motor complex economics, machinery manufacturing, automated control systems and traffic safety, as well as with the requirements of Higher Attestation Commission of the Ministry of Education and Science publications , reflecting the content of master's and doctoral theses. The journal items covered include publishing a wide range of scientific disciplines: engineering pedagogy ; conceptual problems of the motor industry; technosphere safety; reliability of machines and transport facilities; diagnostics, quality control of construction; road and communal vehicles; economics and management; information technologies, traffic safety. 05.23.19 – Ecological safety of construction and urban economy (technical sciences). Distributed by subscription of "Rospechat" Index 36244. Registered in the ISSN International Centre under the number 2079-1364. "Vestnik MADI" is included in the Russian Index of Science Citation (RISC) and has a five-year impact factor of 0.316. Journal metadata is published in the International Directory «Ulrich's Periodical Directory». Journal is issued 4 times per year (March, June, September, December), with 120 pages. The journal is known in more than 350 higher educational institutions of Russia and the CIS, arouses great interest among readers who feel need in it.